Apply to join Forrester Construction, Hopkins Local and other industry experts at the BLocal BUILD College training sessions for small businesses. 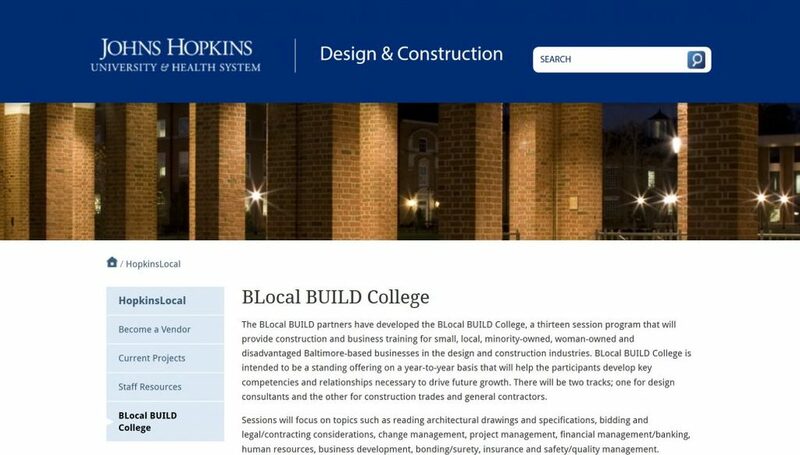 Forrester Construction has partnered with Hopkins Local’s to participate in the BLocal BUILD College, a thirteen session program that provides training for small, local, minority, woman-owned and disadvantaged Baltimore-based design and construction businesses. Participants will develop key competencies and relationships to drive future growth. Join Forrester for a training series focused on growing small businesses. The program also has a strong focus on relationship building and will include networking opportunities to connect with industry experts. Sessions will be held Wednesday evenings from 5:30 pm to 8:00 pm June 8 through September 14, 2016. Local business partners are invited to keep building with Forrester by applying today. Click here for more information.